Spring cleaning is in full force in my home. While my wife organizes and adds to an ever-growing pile ready for The Salvation Army, I find myself in full archaeology mode, sorting through the artifacts of my life. Indeed, I hold onto nearly everything until such day I find the will to let it go or somehow my stuff “mysteriously” joins that ever-growing pile ready for The Salvation Army. A good portion of “my stuff” are books, printed articles, and training workshop materials going back 25 plus years. I have created and collected much in my career and most of it now rests in my garage. I am enjoying reviewing and organizing all this material knowing that I will use it again personally and professionally. 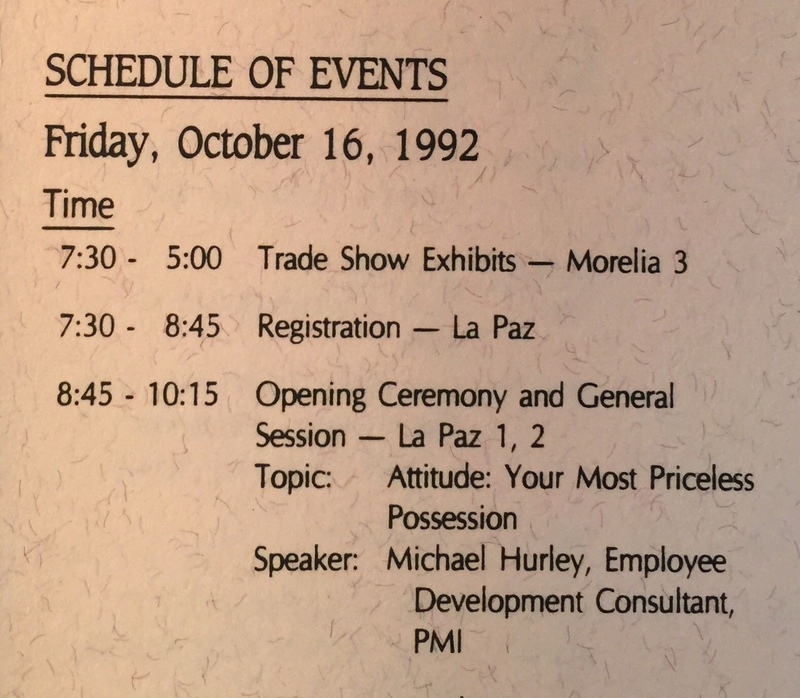 As I dug through my files, one artifact stopped me cold and I was instantly taken back over 20 years to a time when I worked as a corporate trainer. In my hand was a brochure for a professional conference where I was the keynote speaker. The conference, located in Kansas City, was for the Association of Professional Mortgage Women. The title of my keynote talk was, “Attitude: Your Most Priceless Possession”. Indeed, so early in my career, I stood in-front of hundreds of people and had my Tony Robbins moment. You know Tony Robbins, the self-help motivational speaker, known for fire-walking and his amazing stage presence. Along with that brochure, I found my speaking materials from that day. As I now read my notes, I can imagine Tony himself delivering the content on the importance of a positive and expressive Attitude. I smile at the memory and the guts it took for me (at 28 years old) to stand and deliver in front of all those professionals in my industry. This was not a talk from a raised stage behind a podium. I was preaching that day on Attitude and as memory serves, I abandoned the stage to get closer to the crowd and work the room. I learned a lesson that day on the importance of generating and gathering energy and redistributing it as needed throughout the room. I think Tony Robbins would have been proud of my effort and outcome. The memory fades and I find myself back to my present, my reality. My job hunt continues. Working on a couple strong options, but progress is slow and my future is unclear. Never have I more needed a positive and actionable Attitude toward life. I can look to Tony Robbins or countless others for advice and counsel. Yet, no need. I found my guru on Attitude. He is me, that boy who stood and delivered so many years ago full of energy and life. He is with me still and the man I grown to be. Thanks David. I still see the path ahead and step forward. Thanks for your inspiration. Once again my dear brother you transport your reader to feeling everything you were saying. Bravo to you for wonderful writing. You truly have a gift. I have all the faith in the world your day is coming soon for that job of your dreams. Stay inspired. You sure inspire me.